Oops - we don't appear to have a video for the ADS-2100e. 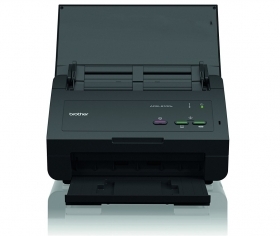 With 24 page per minute (48 images per minute) scan speed through the 50 sheet Automatic Document Feeder (ADF), the ADS-2100e is perfect for small to medium office environments. Scan and archive documents quickly and easily with scan-to Searchable PDF and a range of bundled software. The multipage detection feature identifies paper feed errors; helping to preserve original documents and maintain clear scanned images, whilst the easy to use touch button panel enables scanning direct to a USB storage device or computer.